Paris, France, January 4, 2006 - Apparently, the big secret to getting into the Louvre is to skip the long lines underneath the Pyramid, and instead buy tickets in the attached underground mall. We discovered this secret when we discovered said mall after waiting in the long line underneath the Pyramid. Oh, well. It's a nice enough little mall, with upscale stores - such as this one, which sold kitchen gadgets and housewares and such. I don't remember the name; think Pottery Barn meets Sur La Table. 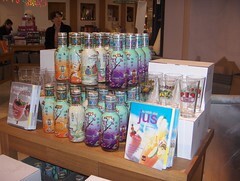 Anyway, there were displays of delicious-looking gourmet foods throughout the store, including this display of... Arizona Iced Tea! We found that hilarious. I mean, we like Arizona Iced Tea, but it's something you can get in the U.S. in any old deli or convenience store. It's certainly not something you'd display in, say, Crate & Barrel and sell for 3.5 Euros ($4.38) a bottle! So will iced tea catch on in France? Or will it forever be considered some peculiar drink from across the ocean (much like we regard boxed milk)? Truly a question to ponder. As for the rest of the Louvre, of course we loved it. We're no art history majors, so we can't really discuss anything about the museum intelligently, but we had a great time. And best of all, there was no 20th-century crap! We took an hour-long tour to get to the highlights (Mona Lisa, Venus de Milo, etc. ), then wandered around for about six or seven more hours, taking only a short break for some coffee (no iced tea). I feel justified in feeling that we've gotten our fill of art for the year, though. Maybe even for two. And that felt just great !